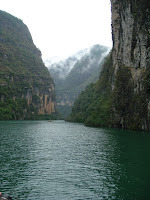 At 7 a.m. we start through the first of the Three Gorges, Qutang. 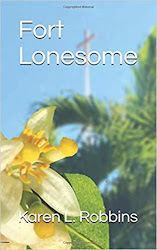 We sit in t he lounge and sip coffee and look at soaring cliffs through pouring rain and fog. Still, the scenery is beautiful. This first area is quite short and we are through by 7:30 and having breakfast in the dining room. The short order chef makes great fried eggs! 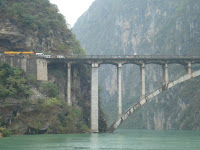 At 8:30, we assemble for our excursion through the Lesser Gorges of the Daning River. (At this point we are somewhere near or in the Wu Gorge?) We board a catamaran-styled boat and are divided into three language groups: English, German and Spanish. The German and Spanish groups head to another part of the boat. We pass under the Dragon Gate Bridge and enter the Dragon Gate Gorge. The scenery is spectacular with cliffs rising high above us. I can only imagine how wonderful it would be were the sun shining. The water is much clearer in the Daning than the Yangtze. Along the way, there are terraced areas that extend to the top of the mountains. Our guide tells us the farmers carry the soil up to the mountains on their backs. Unbelievable to imagine. It is sad to pass places that will be underwater by 2009 when the river has reached its peak flood stage with the dam project. It is at 150 meters now and will be at 175 when the project is finished. 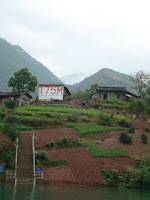 Next to one of the farmhouses is a large sign that displays “175 M” in large red letters signaling the coming water level and the demise of someone’s home. The modern apartments we pass built on the top of the hills and cliffs don’t have the same character as the farmhouses we pass along the river. Still, they are probably an improvement to living conditions. The dam project was supposed to serve 10% of China’s power needs but progress and modernization have advanced so rapidly, says Grace, that when it is completed, it will only be able to provide 5% of the needed energy for the country. It will have displaced 4 million people by its completion. We pass sampans with fishermen. I don’t know what they are catching. There were no fish ladders built into the project so the dolphin and sturgeon that used to inhabit the area during breeding time are gone. Cypress trees soften the rocky cliffs in spots. We are told that they were planted by dropping seeds from an airplane. Along the riverbed, someone has tossed corn and the rhesus monkeys have come down to snack on it. A few other times, we see some in the trees and in the caves in the cliffs. We are able to make out the “hanging coffin” in a cave way up at the top of one cliff. Apparently there were many more of these from the people who inhabited this area some 2000 years ago but they were destroyed in the Cultural Revolution. Our guide points out some grassy plants and tells us that this is the material that rice paper is made of—not rice. On our return to our riverboat, we see a very unusual boat. The front is a huge dragon head. It is a cruise boat too. We have encountered quite a few riverboats that look run down. I wonder if it is because of the conditions along the river—pollution, weather. Hopefully they only appear that way on the outside. We continue our course through the Wu Gorge. There are dramatic sheer cliffs with striated colors. Again I wish the sun were shining. How much more wonderful the scenery would be. 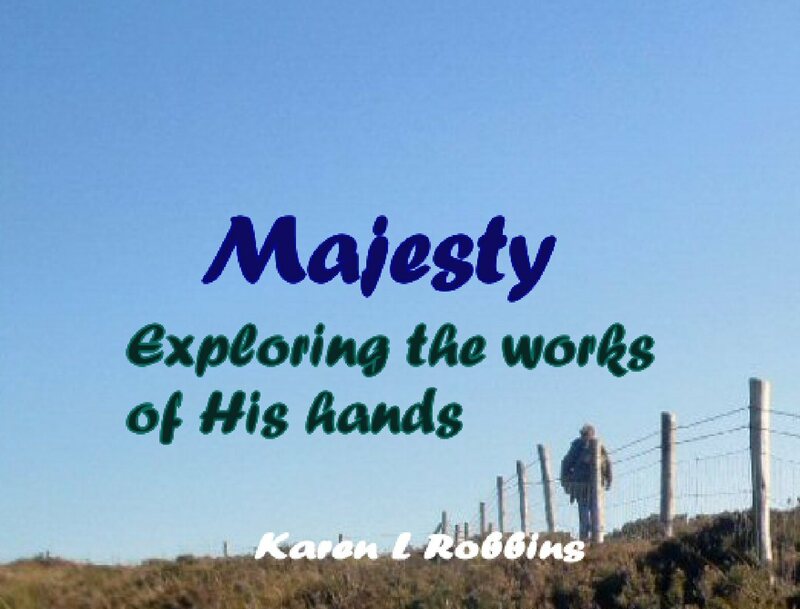 The Goddess Rock is pointed out to us. It is a rock formation in the shape of a woman. 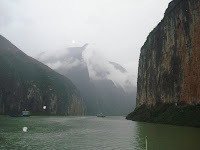 Legend says that it is the Goddess Yaoji w ho vanquished demons and monsters in the Yangtze. She has become the guardian of the gorges. It is growing dark as we pass the Goddess and I take a much needed nap before our special farewell dinner without the standard cruise fare of baked Alaska. Our meal is again on a lazy Susan and again features duck. The evening’s entertainment is a talent show starring the Auzzies, the Spaniards, and our tour guide, Fred. In between acts, the crew provides us with a sampling of traditional dances. They are in colorful costumes, and are very acrobatic and graceful. We dock for the night near Yichang to provide an early start tomorrow for our dam tour.